In modern day Tokyo, society lives in fear of Ghouls: mysterious creatures who look exactly like humans-yet hunger insatiably for their flesh. None of this matters to Ken Kaneki, a bookish and ordinary young man, until a dark and violent encounter turns him into the first ever Ghoul-human half breed. Material: Tinplate + Plastic safety bottom + Stainless steel pins + Surface with a protective film + antioxidant water. Order happy))) sent in 2 days came to Lipetsk 18 days. all as in the photo. Icon is excellent, the picture satisfied I would recommend. Good icon! attached to the backpack. came quickly. A Very good pin, strong and good detail. 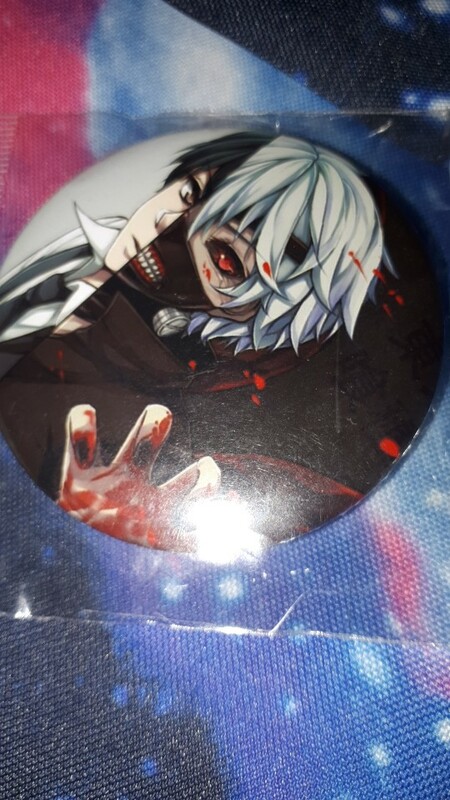 Cool badges for anime lovers! great, excellent quality, lightning fast shipping! I recommend!!!! baby squealing with delight! Badge top quality! I ordered 6.05.2017, it's the post office 30.06.2017. I recommend this store!